Global Genes reports that therapy adherence in the rare disease space can vary from only 58% to 65%, a troubling statistic for our industry, and most importantly, the patients we serve. Manufacturers must be wondering, how well do we really know our patients and what they need? To reverse this troubling trend, many orphan drug innovators are building programs that go far beyond traditional logistics, such as prior authorizations, distribution or collecting reimbursements. 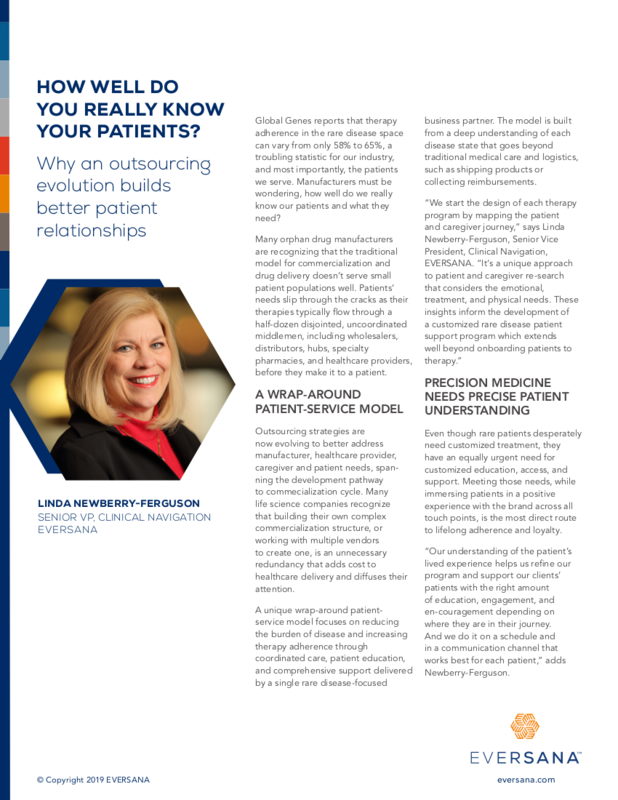 In this short article, Linda Newberry-Ferguson, Senior Vice President, Clinical Navigation, EVERSANA, shares insights from a new commercial and patient support model that’s rooted in a deep understanding of the disease state, collaboration with the patient community and customization to adherence support. “It’s a unique approach to patient and caregiver research that considers the emotional, treatment, and physical needs. These insights inform the development of a customized rare disease patient support program which extends well beyond onboarding patients to therapy and delivers higher adherence for healthier outcomes,” Newberry-Ferguson. Thank you for your interest in the article! Click below to get your copy.